Australia's Perth Mint is known throughout the world for the quality and purity of its products, like the 50 g bar of fine 24 carat gold. With a purity of 999.9 out of 1000, this exceptional investment bar is a favourite of collectors and investors who want value as well as quality. At 50g, it is an affordable choice that still represents a significant boost to any portfolio. What makes investors buy the 50 gran bar? This beautifully struck bar depicts the magnificent swan logo of the Perth Mint along with the weight and purity on its obverse. The reverse of the 50 g bar shows the repeating kangaroo design that acts as an additional security feature. Each of these 50 g gold bars is supplied in assay packaging - a security sealed blister with an authentication certificate from the mint. 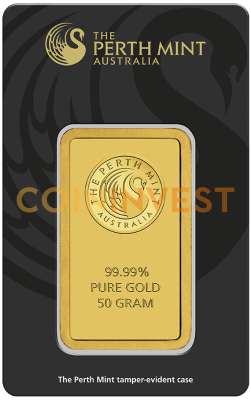 CoinInvest is a direct distributor for this prestigious Australian mint and because we buy larger quantities we are able to offer clients a significantly lower price for the 50 g bar. Gold is a very safe investment option that will never go out of fashion. For centuries, men have used gold for trade and investment purposes and it is the most popular of all precious metals. Buy gold from this revered mint with CoinInvest.com and you are investing in the Outback gold mining heritage that is an iconic part of Australia's history.